Voice chat is one of the most useful features of Blackboard Collaborate. It can also be the most frustrating if your microphone and speakers aren’t set up right. Fortunately, getting your audio set up is easily done. But before we look at audio setup wizard, let’s look at the AUDIO & VIDEO module. The AUDIO & VIDEO module appears in the upper left corner of the Collaborate window. 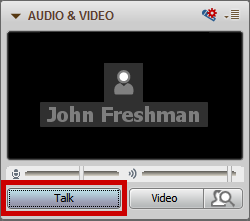 At the bottom of the AUDIO & VIDEO module you’ll see a Talk button and a Video button. If you’d like to talk, click the Talk button. When you’ve said your piece, click the Talk button again to mute your microphone. Above the Talk and Video buttons, you’ll notice there’s a pair of slider bars. The leftmost slider (with a microphone) is for microphone volume, the other (with sound waves) is for speakers. When you see a dark line filling the background of either slider, that indicates sound is going through that feed. So in the image above, the microphone is picking up sound and sending it to the Collaborate room (but audio is not coming from the Collaborate room through my headset or speakers). You can adjust microphone and speaker volume by moving the bar crossing the appropriate slider left or right. 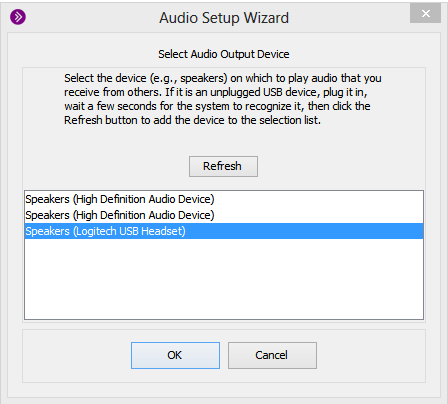 If you are supposed to be hearing audio, or if you have TALK clicked but the microphone bar isn’t picking up anything, you should run the Audio Setup Wizard. You launch the Audio Setup Wizard by clicking the microphone with a red gear icon over it that appears in the upper right corner of the AUDIO & VIDEO module. In the first window, you’ll be selecting an output device (speakers or a headphones). If you’re using a headset, select the headset from list. Note that if you’re using headphones that use a mini-plug (like you’d find on an MP3 player or phone), they will likely appear as Speakers (High Definition Audio Device), not as “headphones”. In the example below, I have a set of earbuds plugged in as well as a USB headset, so I see Speakers (High Definition Audio Device) listed twice — once for my earbuds, once for my computer’s built-in speakers. Unfortunately, the only way to distinguish between the two is experimentation. If you don’t see the appropriate output on the list, make sure it’s properly plugged in then hit REFRESH. Once you have the appropriate output selected, click OK. The next window will let you adjust the volume of your speakers. Hit the PLAY button, then adjust the slider to adjust the volume. Once you have the volume set to a comfortable level (or if you find you selected the wrong set of speakers), press the STOP button. You’ll be asked if you were able to set the volume to a comfortable level. If you’d like to begin the speaker selection process over, click NO. Otherwise, click YES to set up your microphone. The process for selecting the microphone is the same as the process for selecting speakers. Again, you’ll be asked to select the appropriate device (and again, if you have a microphone that’s plugged in using a mini-plug and your computer has a built in microphone you’ll likely see both listed as Microphone (High Definition Audio Device). Click RECORD, speak as you would if you were on the phone, and adjust the slider so you see mostly green with may be a little bit of yellow, then click STOP. Next you’ll be prompted to play back the audio you just recorded. Hit Play and listen. If your recording is loud enough, then click YES on the confirmation page (which will open automatically when your recording finishes). To re-do the microphone setup, click NO. Depending on your computer, you may need to re-run this wizard before every Collaborate session. You should always make sure you log into your Collaborate session with yourself enough time to run the wizard before your session is scheduled to start.